While totally committed to their Edgewood neighborhood and still in love with the charm of their 1934 home, the Lyntons were seeking more space, especially larger-scaled rooms to spread out in and entertain. Instead of moving, they settled on an addition that cleverly joins to the original home and encompasses the backyard carriage house footprint. The project also provided the perfect opportunity for Stephanie Lynton to show off her innate talent for creating bold rooms full of surprises and color. Meet the multi-talented native Texan who, despite 30 years in Birmingham, maintains some of that independent Lone Star State spirit. When it comes to her decorating aesthetic, Stephanie is writing her own music, a tune that’s filled with zesty color, a mix of styles, plenty of personality, and a well-honed eye for detail. Her passion for design took root as a child when, instead of playing with Barbie, she was constantly decorating the doll’s three-story Dreamhouse. “I used everyday things I found around the house, ” says Stephanie. “Patterned paper towels were wallpaper and drapes, and big matchboxes—don’t get me started—they made great dressers, sofas, etc.” While practicing law for 25 years, Stephanie pursued her early passion on the side. And once she had her own home, she began studying design in earnest. As any successful attorney would, Stephanie made sure she was well-versed and prepared before starting every project. 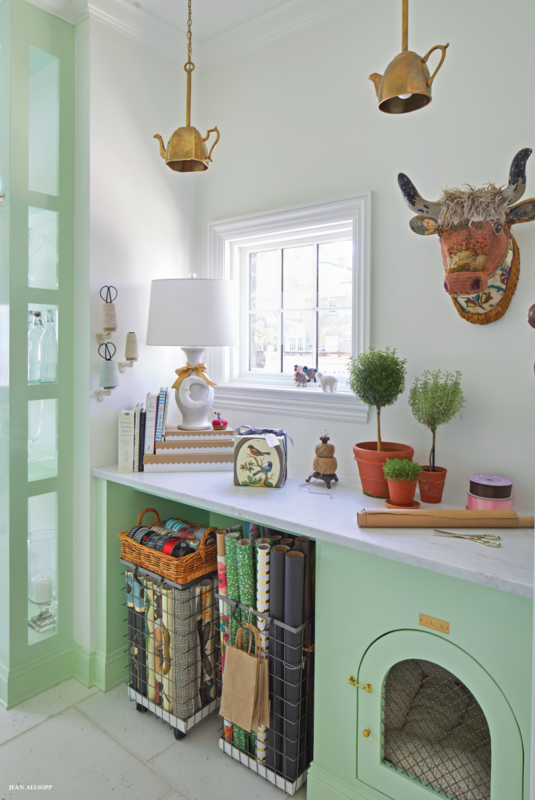 She eventually traded in her legal briefs for paint chips, and the result speaks for itself in her Homewood home—a collection of chic rooms beyond even Barbie’s wildest dreams. 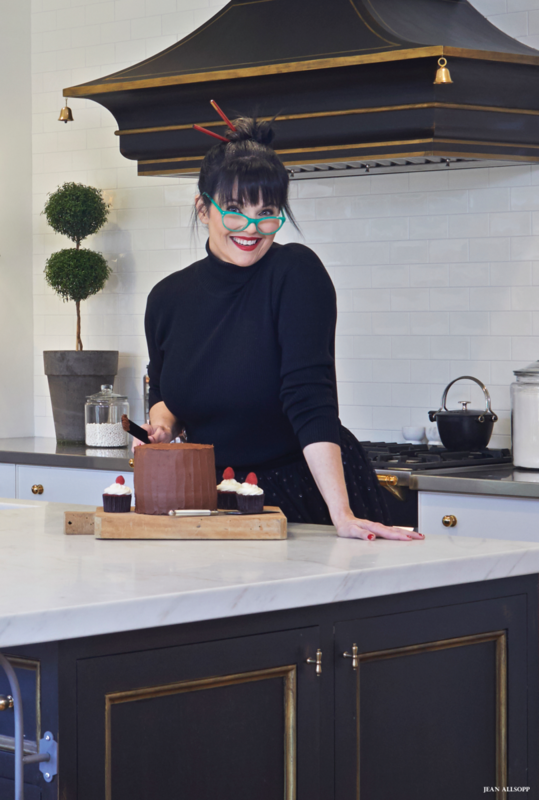 The kitchen has all the dreamed of items for preparing family meals and for lots of baking, including a convection wall oven, a standing mixer lift, and a Lacanche range with a custom hood designed by Stephanie that’s evocative of a pagoda. 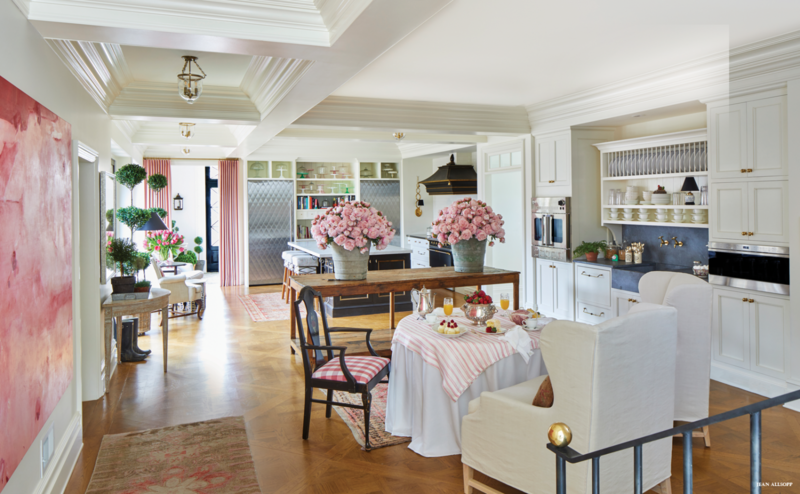 But the area also houses a La Mattina (Italian for “the morning”) and contains everything the Lynton family and guests need for breakfast collected together along one wall—built in refrigerator, freezer, and dishwasher drawers; an espresso maker; a sink, and storage for cereals and the like. 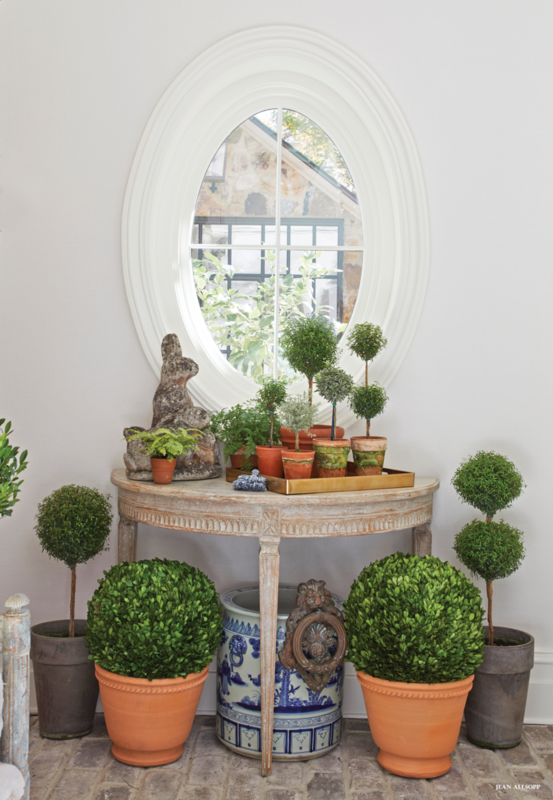 The entry area in the addition resembles a conservatory with a variety of topiaries and containers filled with boxwoods from Shoppe in Forest Park. A demilune table (part of a pair) sits prettily under a recessed circular window that was on Stephanie’s must-have list. The tableau includes an antique stone statuary of a rabbit family from one of her favorite resources for French antiques in Charleston. Stephanie says that calling this space a pantry really does it a disservice because it’s so much more—storage and display for days, including an antique pine hutch-turned-bar and a place for guests to gather. “We had a party recently, and our friends moved right through the kitchen and into the pantry, ” she says. 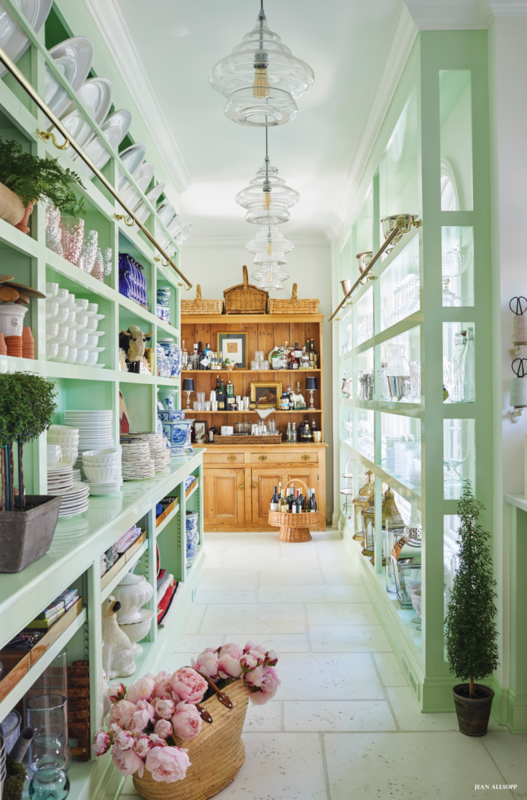 “I think it’s a pretty and cozy place to hang out.” The custom mint shade, based on the signature box from Ladurée—the Paris confectionary known for its delectable macarons—is just one of the many color surprises throughout the home. An extension of the pantry provides a hardworking space for projects and gift-wrapping with its ‘Colorado Gold’ marble countertop (also used in the kitchen). The area is decorated with whimsical teapot brass lanterns and a mounted “long-horned steer head” made out of a mix of materials that gives a nod to Stephanie’s Texas roots. Even the family pet, Jack, scored in the pantry with a built-in custom dog bed that blends in with just the right amount of style. “I just had to have a canopy bed, ” laughs Stephanie. “It was a childhood dream of mine!” The fabric treatment hangs directly from the ceiling, creating a dramatic focal point in the space. The hotel suite-like room is wrapped with lacquered walls and built-in bookcases in Benjamin Moore’s ‘Polo Blue.’ An English antique chest, a Swedish settee, and pillows in a checked print bring in a casual note. The master bathroom emits a cool vibe with stained and glazed white oak cabinetry expertly finished by Daniel Whitsett of Paintworks Design Studio. The zigzag floor treatment adds unexpected character to the room balanced out by the sophistication of the paneled walls. 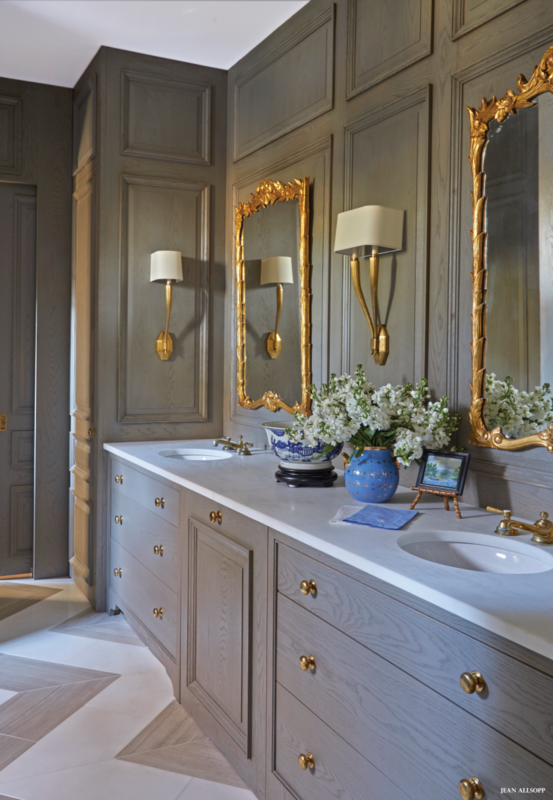 While the room offers a bit of restraint, it also included doses of glamour with ornate curvy mirrors, shapely gold sconces, and gold pulls on the drawers. Stephanie’s artistry is evident in this seamless blend of masculine and feminine elements. No space is left unconsidered, as this vignette at the top of the stairs demonstrates. “This is my homage to the British 19th-century architect Sir John Soane, who collected all types of architectural artifacts, especially plaster casts, ” says Stephanie. 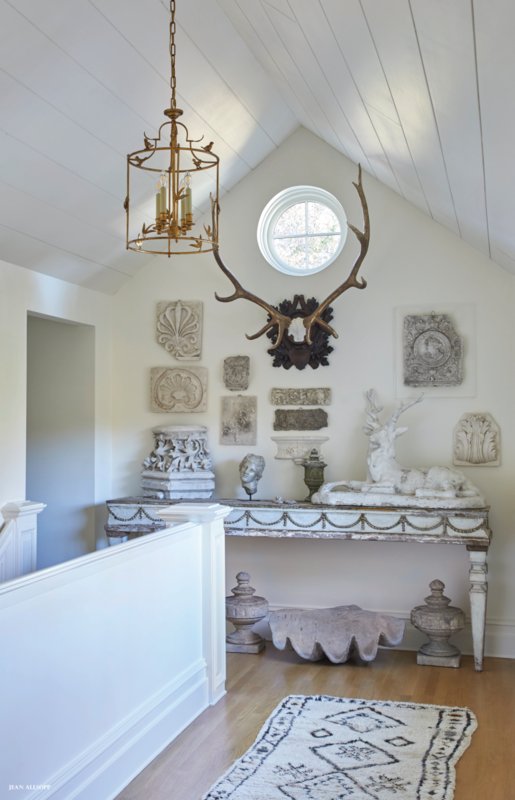 An antique console table holds her collection—19th-century French stone finials; a 19th-century plaster cast from Bruges, Belgium; and other antique plaster fragments. Closet space—something seriously lacking in the original house—is abundant in the addition. Stephanie made sure that the master closet—a decidedly glamorous room—would have a place for everything. It’s full of black pocket doors with gold trim hand-applied by Stephanie. The inside of her closet is a custom red tone, which makes a pretty backdrop for her shoes and handbags. This area is spacious enough to hold a French armchair and side table. 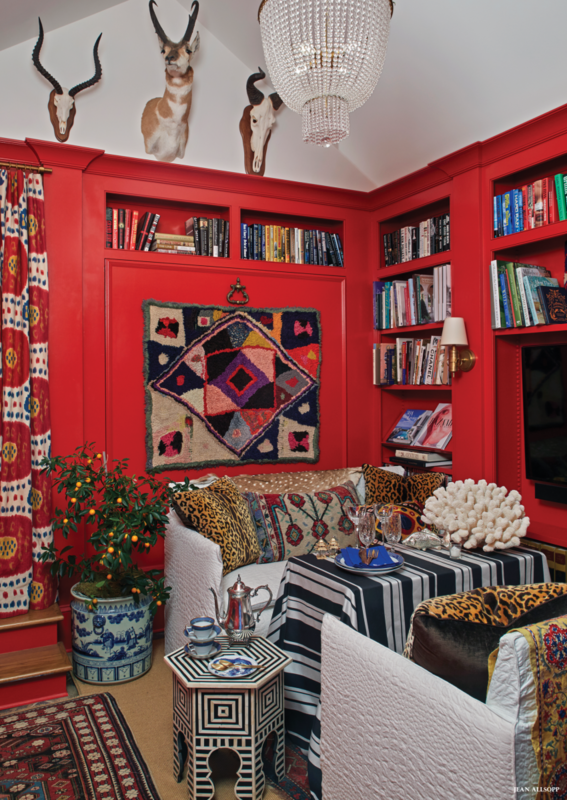 “This room was about creating a happy space full of color and pattern, ” says Stephanie. “I was inspired by portraits of a Tibetan man and woman and the colorful, layered clothing and accessories they are wearing.” In that vein, the walls are painted a vivid saffron orange like the robes of Tibetan monks. 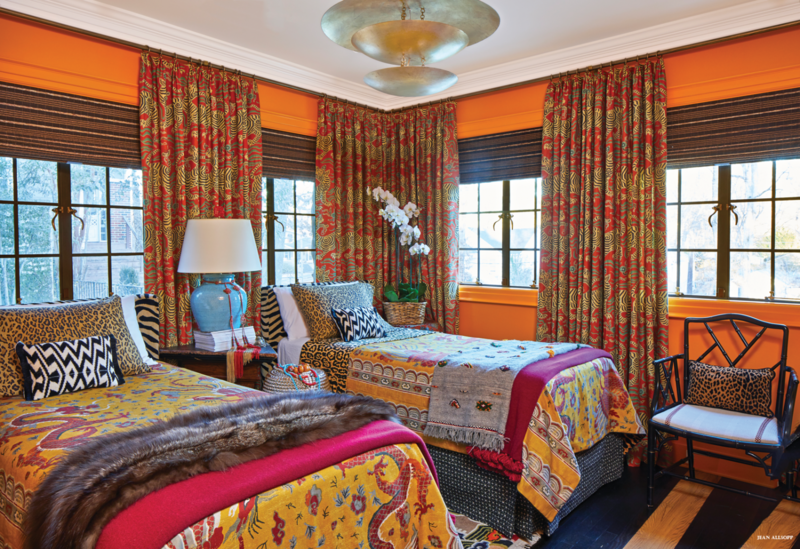 A Clarence House tiger-print fabric (aptly named ‘Tibet’) in a cinnabar colorway makes up the window panels, while the varied patterned fabrics for the bedding work together against the bright walls. 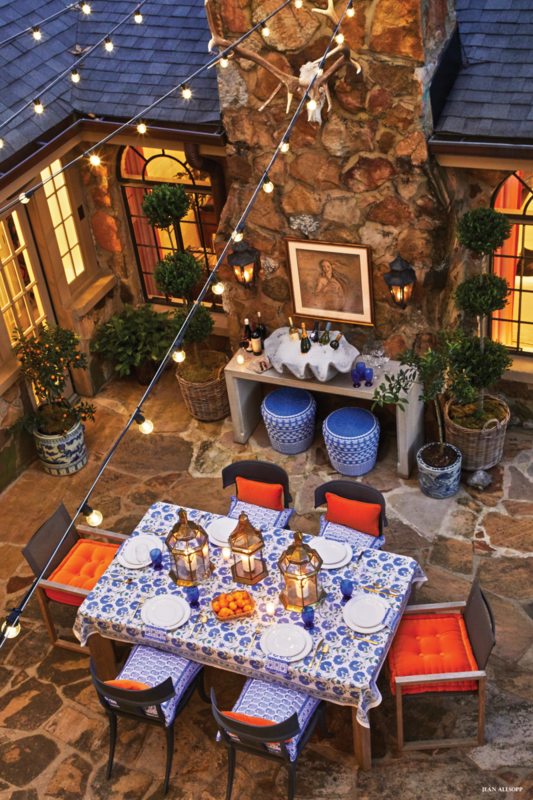 The original stone courtyard has been “Stephanized” with plenty of bright color paired with comfort. Deep cushioned chairs and a large table invite guests to linger over meals. The orange-and-blue combination speaks to the interiors, creating a sense of continuity inside and out. A stone console table serves as a buffet with a giant clam shell for chilling the wine. To make the space feel more like a room, Stephanie hung a piece of artwork over the console.